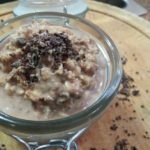 Chocolate Peanut Butter Overnight Oats – This time we’ve made a chocolate peanut butter overnight oats recipe for the kids which they will love! But don’t worry as it is full of Super goodness too, and will keep them going right through to lunchtime. – oats (gluten free if possible), chia seeds, milled flax seeds (or use whole flax seeds), 100% cacao powder, Peanut butter ( 100% pure), pure maple syrup, almond milk, cacao nibs, Place all ingredients except for the peanut butter and the cacao nibs in a bowl and stir well. ; Place the mixture in a jar or a bowl and refrigerate overnight. ; Next morning, the oats are ready to eat cold or hot. Just before eating stir in the peanut butter and sprinkle the cacao nibs on the top. ; – You can add a chopped banana to this just before eating, or add some chopped pecan nuts.. This time we've made a chocolate peanut butter overnight oats recipe for the kids which they will love! But don't worry as it is full of Super goodness too, and will keep them going right through to lunchtime. Place all ingredients except for the peanut butter and the cacao nibs in a bowl and stir well. Place the mixture in a jar or a bowl and refrigerate overnight. Next morning, the oats are ready to eat cold or hot. Just before eating stir in the peanut butter and sprinkle the cacao nibs on the top. You can add a chopped banana to this just before eating, or add some chopped pecan nuts..